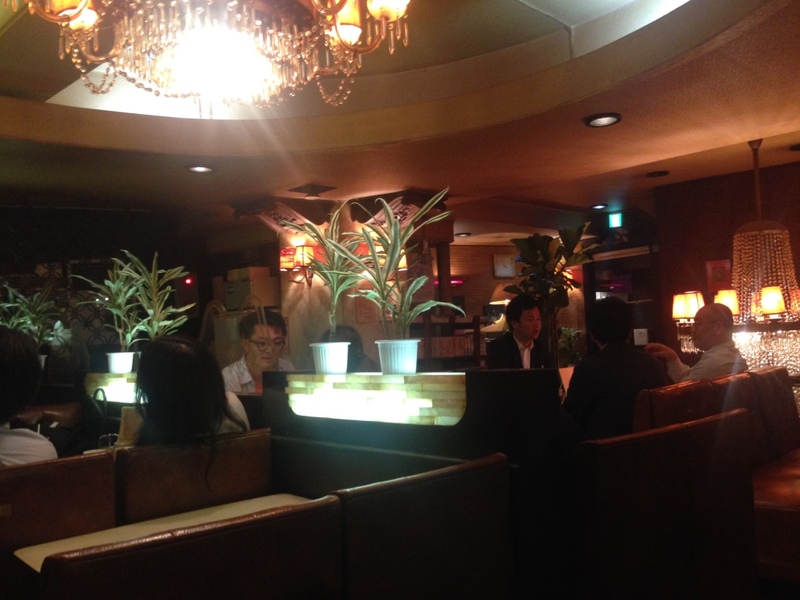 Probably many people are looking forward to having dinner during their travel to Tokyo for sightseeing. As you know, Tokyo is the city where it has the most‘the Michelin Guide’ stars restaurants in the world. We can absolutely say the fun in Tokyo is a meal. Today, I am going to introduce you a recommended Ordinary Coffee Shopfor a break in your sightseeing because I bet you have already known about the information of the delicious places in Tokyo by many medias. “Ordinary Coffee Shop” (純喫茶 Junkissa）generally means a café without‘alcohol.’　In Japan, thesedays, cafes, fast-food restaurants like McDdonald’s, or Family restarants like Denny’s are familiar for especially young people between 20〜30 years old in order to take a break expect for their breakfasts, lunches, and suppers. 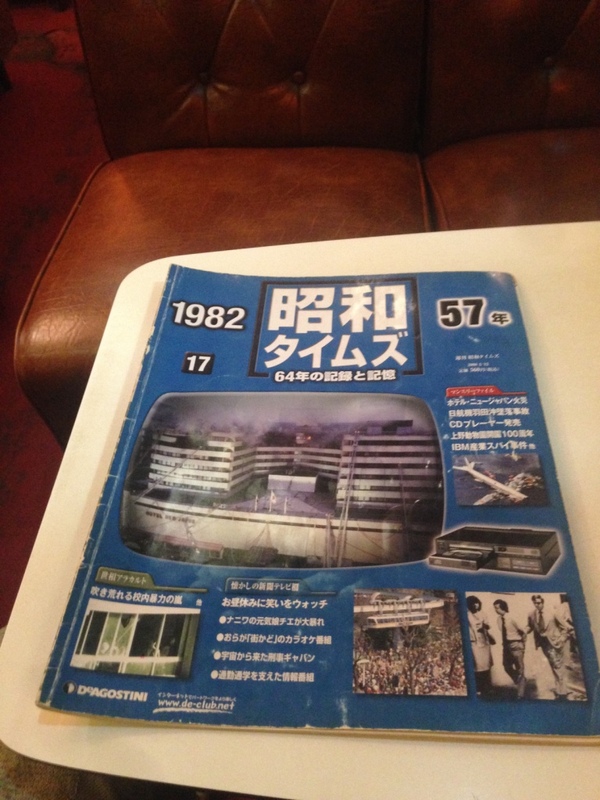 But in Showa era, when there were not foreign coffee chains yet, cafes like Ordinary Coffee Shops were common. Ordinary Coffee Shop “OKA” in Ueno, where I’m ging to introduce you today, is one of such café. The shop is located in the place to go for 2 minutes on foot to Ueno along the railway track from JR Okachimachi station. The purple signboard is the mark of OKA. The shop includes the first and the second basements. 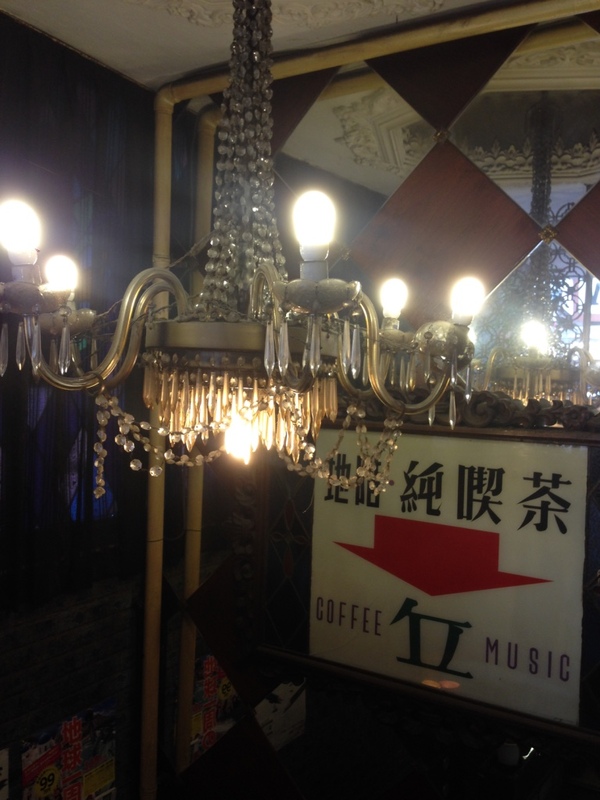 The antique chandelier of the entrance and the style of writing on the signboard of the shop seem to be nostalgic. Inside of the shop, the atmosphere is different from other general cafes, I mean, a little bit dark and most customers are rather older. This shop opened in 1964, when the former Tokyo Olympics was hold. You know what? It was 51 years ago from now! It seems as if time stops only in this shop. 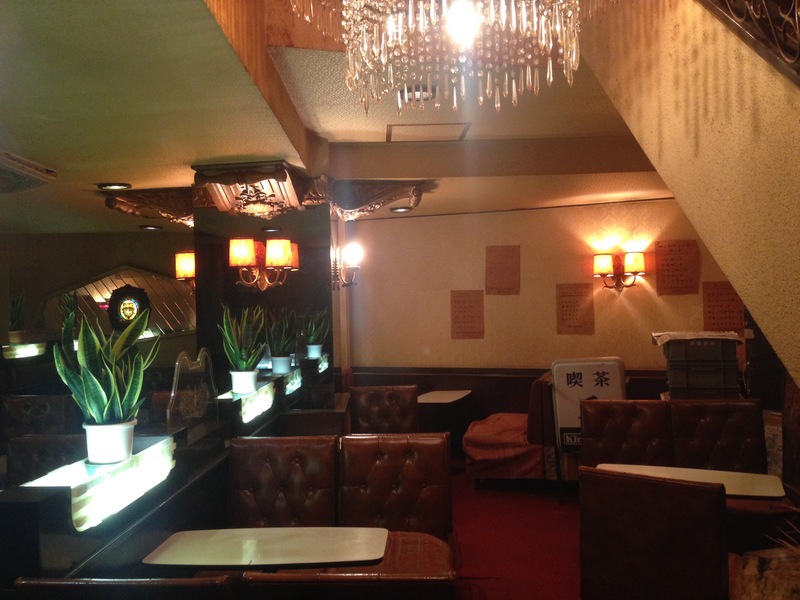 The leather sofa in dark red and also the lightings on the wall make me feel nostalgic atmosphere of Showa era. The best feature of the shop is this gorgeous chandelier built in a stairwell from the first basement down to second basement. 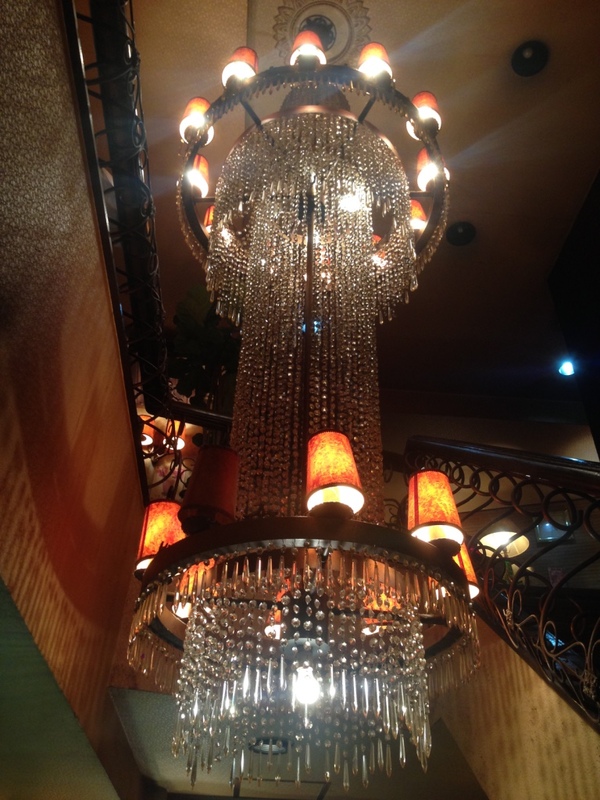 Usually you are rarely able to see such a high chandelier. It really creates an aura of a different space. 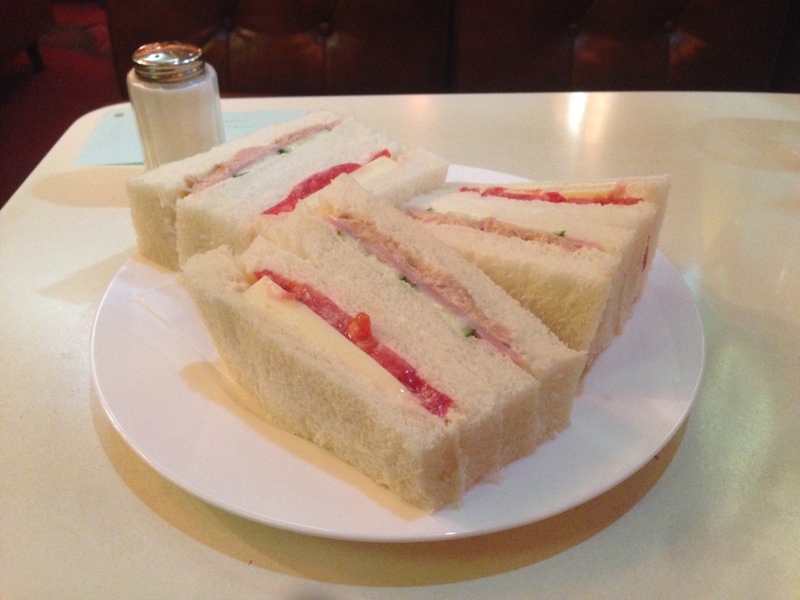 The best menu of the shop is Neapolitan spaghetti; however, I was not so hungry and ordered sandwiches. Different from the one from convenient stores or chain shops, I felt a very rich recipe and it was too delicious. The magazines here are selected, considering the customers’ age, I suppose. I had to pick up this magazine because its content was about the matters in my birth year. In the shop, you can listen to George Benson’s comfortable Jazz. This coffee shop is the perfect place for the person who wants to taste good old Japan. There are some good sights to see around the shop here and there. Shinobazu-no-ike in facing of the shop across JR railway tracks. 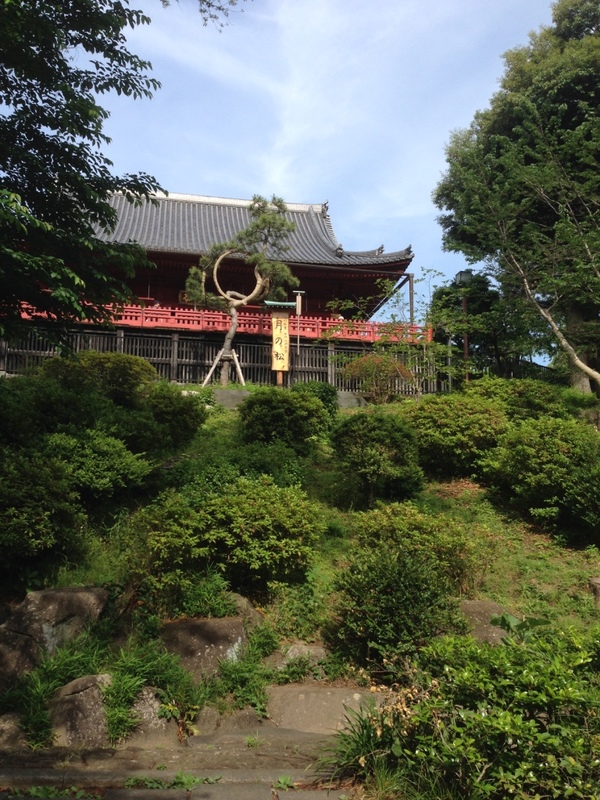 In addition, Kiyomizu Kan-non Do in Kan-ei-ji Temple which was built in imitation of Kiyomizu-dera Temple of Kyoto. 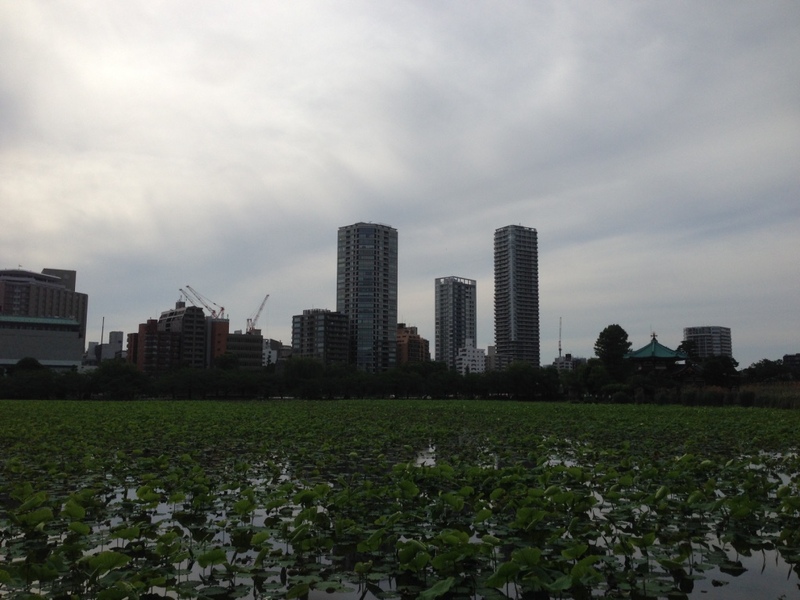 Now, you cannot see very well behind the grove, however, it says that the people in Edo era used to see Shinobazu-no-ike. This is also a fine spot to visit when you come to Ueno. National Museum of Nature and Science, Tokyo National Museum, Ueno Zoological Gardens, Ameyoko (shopping area), and so on. Ueno has a lot of spots to see here and there. I want you to take a break in an Ordinary Coffee Shop where Japanese people in Showa era used to love. Access：about 3 mins. walk from the north exit of JR Okachimachi sta.